We are proud to finally offer a selection of grates for gas grills made to particularly fit Weber's® most popular series including the "Go Anywhere" and "Genesis Spirit" Series. Since our grates are so popular with charcoal grill users, we thought it would be a good idea to make them available to gas grill users as well. We all know that heavy duty cast iron is the optimal cooking grid for any grill. It's not only about getting back to the basics of cooking outdoors; it's also about having the tools to do it right and that's where we come in. The ideal cooking surface will lock in the flavors and soak up the heat just enough without burning. Our grids are designed to meet the high standards and expectations of professionals and apprentices when it comes to grilling. We have high standards ourselves and our products must meet our tough quality control guidelines before ever leaving the factory. Manufactured by Barbequer BBQ Innovation aka 4GrillersJoy in Germany. We season our grids before-hand, leaving a sleek, non-stick, rust proof finish. After cooking, just brush the grate clean in seconds. As with all cast iron products, further seasoning may be required with time. There's just something about sear marks when cooking on the grill. It's like a work of art; the final touch. However, not all grill grids and grates are considered equal. Our cast iron grates heat up better than any other surface. Other cooking surfaces DO NOT get as hot as cast iron, thus they can't compete when it comes to those beautiful grill marks you're looking for. Testimonial: "You will love them! 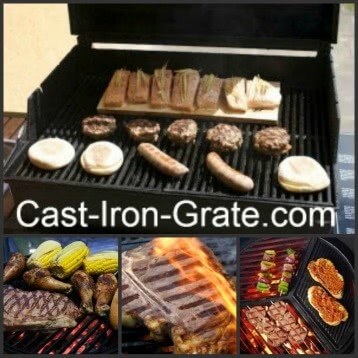 They are by far the best cast Iron grates I ever used and seen!" Shawn B.